Isn't it great when a whole bunch of kids get together and sing out loud to God! 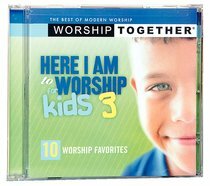 This CD has 10 amazing worship songs written especially for kids who want to jump, shout, and wiggle about in praise to their heavenly Father. About "Worship Together: Here I Am to Worship For Kids 3"